The Nature Conservancy plans to use settlement money from the Deepwater Horizon oil spill to construct new oyster reefs in Galveston and Copano bays. With oyster populations in Texas at historic lows, The Nature Conservancy is launching two new reef restoration projects that look to appease commercial fishermen and environmentalists alike. Using funds from two different settlements — including the one stemming from the Deepwater Horizon oil spill — the group plans to develop 110 acres of reef in Galveston Bay and Copano Bay, near Rockport. Half of each reef will be designated as a marine sanctuary where the molluscs — which have significant economic and environmental benefits — may grow. The other half will be open for commercial fishing. Construction of the new reefs is expected to begin this winter, with harvestable portions ready as soon as 2021. Laura Huffman, regional director of The Nature Conservancy in Texas, said these projects show a new approach to oyster reef restoration, with the compatibility of building harvestable reefs while growing a healthy habitat. After years of overharvesting and widespread coastal destruction during hurricanes Ike and Harvey, the number of Texas oysters has dwindled to a fraction of their former population. The Nature Conservancy estimates that as much as 50 percent of original reefs remain in the Gulf of Mexico. And in some parts of the coast, it estimates 80 percent of reefs have been destroyed. The trend poses a big threat to the health and resiliency of the coast. Among other things, oysters can rapidly filter contaminants out of seawater. Then there's the economic benefit. Oysters harvested from the Gulf of Mexico provide half of all oysters eaten in the United States each year — the bulk of which come from Texas and Louisiana, according to Huffman. She said the industry is valued at $43 million each year. A recent Nature Conservancy report describes oysters as "the ecological building blocks for the Gulf Coast." 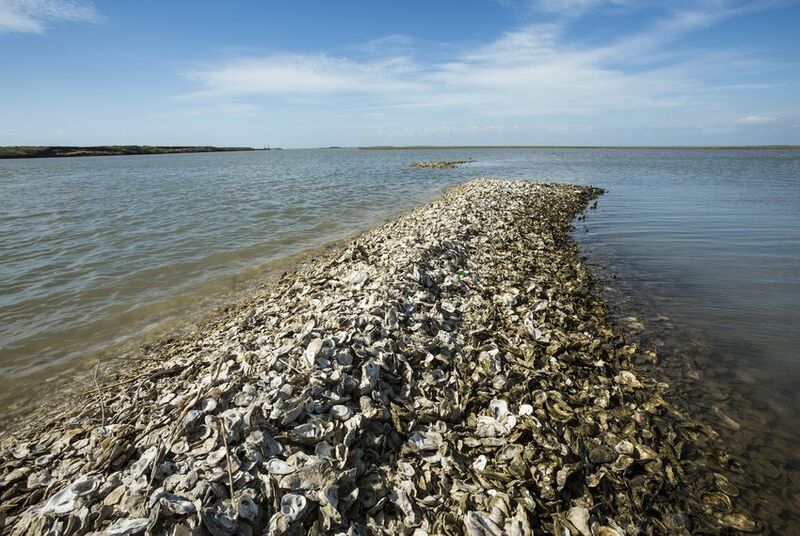 The new reefs will give oysters a better chance at reaching adulthood, which takes about two years, said Lance Robinson, coastal fisheries deputy director at the Texas Parks and Wildlife Department. Robinson is working with The Nature Conservancy on both of these projects. He said building reefs provides a continual source of juvenile oysters that will populate bay systems up and down the Texas coast. Oysters, as natural filters, then improve water quality. Besides the oysters’ seafood value, Robinson said their stationary reefs serve as a natural barrier against hurricanes. They also are an all-service habitat for a variety of marine life. Oysters excrete something called psuedofeces, which shrimp and crabs eat as food. That carries up the food chain, as other species come in to feed. The unique feature of these reef projects is that they are divided into sanctuary and areas for commercial harvest, Robinson said. By building reefs, The Nature Conservancy is replicating the shell oyster larvae need to latch onto to become adult oysters. Developing oyster larvae float in the water until they find a resting place. These projects will complement recent legislative efforts to crack down on overharvesting. Last session, state Rep. Ryan Guillen, D-Rio Grande Valley, passed House Bill 51, which, in addition to a buyback program, created a stronger penalty for fishermen harvesting undersized oysters and authorized a fee. Instead of a Class C misdemeanor, a Class B would be issued for multiple violations. It also makes each individual on a boat responsible for violating the law. Robinson said the penalty acts as a deterrent, with fishermen at risk of losing their license up to 30 days. Harvesting undersized oysters became a major problem after flooding in 2015 and 2016, and Hurricane Harvey in 2017, led to widespread oyster mortality. As demand rose, the price per sack went up, and some fishermen ignored the three-inch size required to harvest an oyster. Oyster regulations require that any oyster under three inches be returned to its reef, according to the Texas Parks & Wildlife website. Huffman, the Texas regional director of The Nature Conservancy, said her organization has deep experience with these types of construction projects, pointing to a previous reef restoration at Half Moon Reef in Matagorda Bay. Correction: A previous version of this story incorrectly stated that both reef restoration projects will be paid for by funds from the Deepwater Horizon oil spill settlement. Disclosure: The Nature Conservancy and the Texas Parks and Wildlife Department have been financial supporters of The Texas Tribune, a nonprofit, nonpartisan news organization that is funded in part by donations from members, foundations and corporate sponsors. Financial supporters play no role in the Tribune's journalism. Find a complete list of them here.